Cedar Falls was known as a railroad city in the late 19th century, when four lines connected here. These lines, and the dates when they arrived in Cedar Falls, were the Dubuque and Pacific, now the Illinois Central (1861), the Cedar Falls and Minnesota (1870), the Chicago Great Western (1884) and the Burlington, Cedar Rapids and Northern (1863). As a railroad hub, Cedar Falls had easy access to Minneapolis/St. Paul, Chicago, St. Louis, New Orleans, Des Moines, Kansas City and other locations. In 1893, for example, it was possible for a passenger to ride from Cedar Falls to Chicago over three different railroads without changing cars. In 1893, 36 trains were operating in and out of Cedar Falls every day. Products moving out of Cedar Falls included 520,000 pounds of butter annually, 856 cars of flour and mill stuff, 296 cars of livestock and 200 cars of grain. Products moving into Cedar Falls included 1,590 cars of lumber, 880 cars of wheat and oats, 196 cars of machinery and 75 cars of straw for the Cedar Falls Paper Manufacturing Company. The Burlington, Cedar Rapids and Northern Railroad originally used the Rock Island Depot. The six passenger and six freight trains that once operated out of Cedar Falls on a north-south route used it. 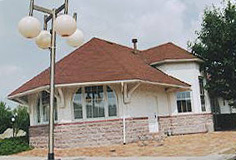 It was renovated and served as a restaurant known as The Depot from 1972 - 1986.